A portion of the arterial Majerhat bridge in southern Kolkata collapsed Tuesday, trapping several people and crushing many vehicles, police said. State minister Chandrima Bhattacharya said she has heard about the death of five persons in the incident but it was yet to be confirmed. Another minister Firhad Hakim said six persons were taken to hospital. 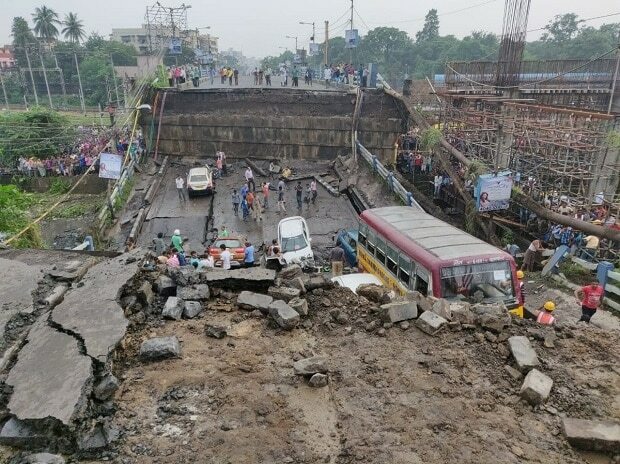 As crowds gathered at the spot in congested Alipore locality, where mangled cars were buried under the debris of the bridge, Chief Minister Mamata Banerjee said the first priority is to rescue the injured and those who are trapped. The area has several under-construction buildings nearby. An eyewitness said some people in a minibus and private cars were trapped. Fire brigade, police and NDRF personnel are engaged in rescue work in the fading light.